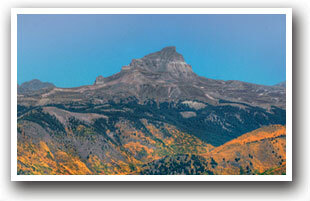 Lake City is home to several 14,000' mountain peaks; Uncompahgre, Sunshine, Handies, Red Cloud and Wetterhorn. Tucked into the grassy canyon where Henson Creek and the Lake Fork of the Gunnison River meet, Lake City is the perfect hub for your southwest Colorado vacation. Explore the historical Victorian charm of downtown with over 75 buildings from the late 1800s - one of Colorado's largest historical districts. 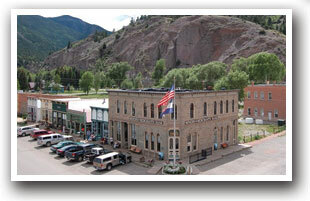 Both Henson and Capitol City are old ghost towns located less than 10 miles west of Lake City. One story refuses to disappear from history; in 1874, Alfred Packer guided some prospectors through the nearby snow-covered mountains. Six weeks later, he appeared 76 miles to the northeast alone with a beard and long hair. He claimed to have survived on roots and berries but Packer was accused of murder and cannibalism and sentenced to hang in 1883 at Lake City's courthouse. Packer got off on a legality of an unconstitutional trial and ended up only serving 5 years in jail. Hike in one of the National Forests that surround Lake City: Uncompahgre or Gunnison. Or try a stretch of The Colorado Trail running along the southwest side in Gunnison National Forest. Lake City is lucky in that two wonderful Scenic Byways run through it. The Alpine Loop Backcountry Scenic Byway begins in town and runs through Ouray and then on to Silverton on 65 miles of dirt and gravel roads. The backcountry byway has some of the most stunning four-wheel driving in the world! The Silver Thread Scenic and Historic Byway ribbons through the communities of South Fork, Wagon Wheel Gap, Creede, Lake City, and Powderhorn until it connects with Highway 50. Once a toll road and stage route for miners, it is now a 75-mile paved highway. Water activities: Fish for trout in the Blue Mesa Reservoir, Gunnison River or other places around Lake City; raft along the Lake Fork of the Gunnison River; try boating on spectacular Lake San Cristobal, Colorado's 2nd largest natural lake created by the Slumgullion Earthflow. 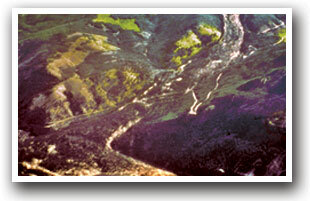 About 700 years ago, a mass of earth material began sliding down toward the valley and dammed up Lake San Cristobal. It was designated a National Natural Landmark in 1983 and still continues to move about 7 meters each year. Some other awesome outdoor activities include Jeeping/ATVing or snowmobiling to the east and west of Lake City. Lake City is 140 miles north of the Colorado-New Mexico border and sits between Gunnison and South Fork along Highway 149. Powderhorn is 30 miles north of Lake City. Commercial air travel accommodations are handled by three different regional airports: the Gunnison-Crested Butte Airport; the Montrose Municipal Airport; and the Durango - La Plata County Airport. Please contact your preferred travel agent or airline for flight arrangements. 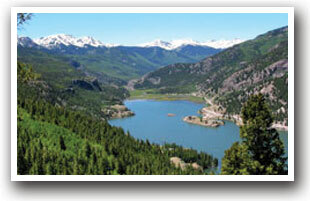 Lake City is 54 miles southwest of Gunnison; 102 miles northeast from Montrose; and 170 miles northeast of Durango.